Once you arrive in Leh, you will be welcomed by one of our representatives who will drive you to a Ladakhi style guest house or a hotel. Since Leh is at very high altitude, you will be asked to take complete rest and get acclimatized to the climate as well as altitude. In the evening you will be taken to Shanti stupa to enjoy the sunset. Head back for a good night’s sleep at the hotel. On the second day, soon after breakfast you will be taken on a sightseeing tour of Ladakh. First on the list will be the Magnetic Hill, which is said to defy the law of gravity. Next, you will be escorted to Sangam just 4 km before Nimmu village. The Sangam is a beautiful spot where you can witness the confluence of the two rivers - Zanskar and Indus. After a dip in Sangam, you will be taken to visit and offer prayers at the Gurdwara Patthar Sahib and Spituk Gompa, which is at a distance of about 9 km from Leh. From the monastery, you can see the whole of Indus valley on one side and the town of Leh and the airport on the other. After a halt for lunch you will be taken to see Ladakh Hall of Fame and the beautiful Leh Palace that was built by the Namgyal dynasty in the 17th century. After a lovely day spent sightseeing, you will head back for dinner and rest to your hotel. After an early breakfast, you will head out on a long drive of about five hours to Nubra, which is also known as the Valley of Flowers. After another two-hour drive, you will reach Khardung La, which is about 18,380 feet above sea level and is the world’s highest motorable road. From atop this point, the view is truly breathtaking. You will get a mesmerizing view of the Indus valley and its snowcapped peaks towering the skies. On a bright and clear day, you can also view the Karakorum Mountain range from this point. After spending some time here, you will be escorted down to the valley and taken to a camp where you can rest for a while. Before sunset, you will set out on a short drive to Hunder sand dunes, where you can enjoy a ride on a double humped bacterium camel. If there is more time at hand you will also be let to stroll through the village and witness the local people and their lives at close quarters. With this, we come to an end of day three, and you will be taken back to your hotel for dinner and sleep. Morning after breakfast, we will visit the most picturesque DiskIt Monastery on the hill top. Later, you will continue drive to other side of Nubra Valley, which was the main part of silk route. We will continue our drive back to Leh via Khardung la. On reaching Leh, our representative will facilitate hotel check-in where you will stay overnight. After a filling breakfast, you will be taken for a visit to Pangong Lake. The 296km-drive is scenic and you will cross the Changla Pass that is 17,570 ft above sea level. The lake itself is at an elevation of 13,930 feet, and you will take at least five hours to reach. The lake leads into a narrow and long basin of inland drainage, which is just seven km wide at its widest point and spans over 125 km. It is bisected by the international border that separates India and China. It is only a few years back that the government decided to open this point to tourists under army surveillance. You will fall in love with the un-spoil nature and scenic backdrops at this lake. You will be driven back to your hotel at Leh, after spending some time at the lake. You will checkout from the hotel soon after breakfast. Arrangements will be made to drop you back at Leh Airport for your onward journey. Ladakh is more than just a tourist destination. This is where you get to connect with and enjoy nature at close quarters. You simply cannot get enough of this hauntingly beautiful spot. There is thrill, beautiful landscapes, sightseeing opportunities and so much more to do at Ladakh that even a whole week here will seem less. So, what are you waiting for? Book a Leh Ladakh trip package for a once in a life time experience. If you have made up your mind on visiting Ladakh and can’t choose from the many holiday packages for Leh Ladakh, look no further. 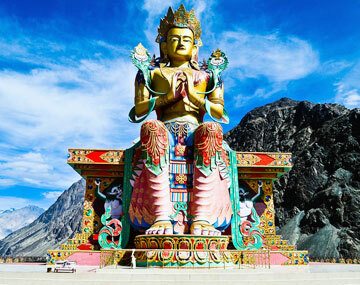 We offer some of the very best Leh Ladakh tour packages on the market. Not only do we take care your accommodation at Ladakh, but also ensure you have a whale of a time on your holiday. Our Leh Ladakh tourism packages cover all the prominent tourist attraction in Leh and also take you to Nubra Valley, which is one of the most splendid valleys in India. We offer the cheapest Leh Ladakh tour packages, but ensure that you are pampered and well cared for throughout the trip. Sightseeing, and land journey, and transfers by a non AC Xylo, Innova, or Scorpio. Carry a valid ID proof such as PAN Card, Driving Licence or Voter’s Id. The check-in and checkout time at all properties mentioned in this package tour will be 9:00 am. You may incur additional costs due to flight cancellation, road blocks/ hike in fare, strike or any other natural calamities or any emergency evacuation etc.